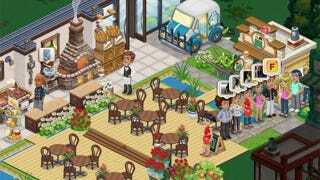 If you ask many former Cafe World players, they'll likely tell you that the constant stream of new catering orders was one of the reasons they stopped playing Zynga's first cooking game. If that's the case, those same players are likely to be very disappointed with the new launch of a catering system in ChefVille, as it's similar to that system in Cafe World. ChefVille's catering system is a series of chapters revolving around a Catering Truck. Players will need to have at least 10 Mastery Stars to participate in Catering Challenges, and these events will be timed. Since the Catering Truck is on a very slow rollout, most ChefVille players currently don't have access to this feature, regardless of level or Mastery Star count. Still, we're here with a helpful FAQ from Zynga that will help you learn more about what to expect. This is a brand new feature that is slowly rolling out to all of our players. Although our features are extensively tested before every release, there are some that cannot be reproduced in a testing environment. This gives us the chance to find and fix these bugs before releasing it to everyone so that we can provide the best experience. We appreciate your patience and understanding. Birthday Ball: A Limited Edition item**, 3 Instant Thyme* and 5 one-hour Thyme. One for the Kiddies: A Limited Edition item**, 10 1-hour Thyme* and 5 one-hour Thyme. Bello's Pre-Birthday: A Limited Edition item**, 3 Instant Thyme* and 5 one-hour Thyme. Party Town: A Limited Edition item**, 10 1-hour Thyme* and 5 one-hour Thyme. Madeline's Birthday Bash: A Limited Edition item**, 3 Instant Thyme* and 5 one-hour Thyme. Pippa's Soiree: A Limited Edition item**, 15 1-hour Thyme* and 5 one-hour Thyme. Silver: 2 Instant Thyme*, 1 one-hour Thyme, 500 Coins and 50 XP. Bronze: 2 Onions, 2 Salami, 2 Long Grain Rice, 2 Parmesan Cheese, 1 Olive Oil, 50 Coins and 10 XP. *You will only receive this reward the first time you receive Gold status on the Catering Order. **The Limited Edition Item varies depending on the Catering Order. You will receive a different Limited Edition item reward for the first three times you repeat the Gold status on a Catering Order. You will see the item before and after the Catering Order has been completed. After you have repeated Gold status 3 times on a Catering Order, you will receive 5 one-hour Thyme instead of a Limited Edition item. And there you have it, a breakdown to the prizes available for Gold medal status on ChefVille's first six Catering Truck orders. You can be sure that we'll have complete details to all of these final Catering Orders as the feature becomes more widespread across the game, so stay tuned!